One of the basic functions of Peikoff's later (post-1970s) lecture courses is to teach people methods of thinking (i.e., the how as distinguished from the what) about Objectivism as well as about any other subject. The essential core of Objectivist method - a responsible (context-appropriate) approach to checking premises - makes Objectivism itself essentially impervious to refutation. Like induction itself, you couldn't even attempt to refute it without implicitly accept and affirming it. Induction is the essence of rational, reality-oriented thought; Rand identified basic principles of inductive reasoning - the most notable achievement being her theory of concepts - and those basic principles are the very basic principles of Objectivism itself. 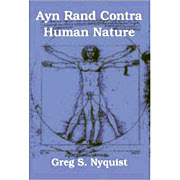 Objectivism is the method of induction applied to the fundamental issues of man and his relationship to existence. In the Utopia I envision for humanity's not-too-distant future, familiarity with Peikoff's courses or something of comparable caliber would be an essential qualification for university professors - hell, all university professors, and not just those in the Humanities. There's really no excuse for educators and intellectuals not to be familiar with this stuff.... Their minds might well be blown at just how insidiously, damagingly rationalistic (or emotionalistic, or otherwise dysfunctional) their thought processes were all along. Then they, too, will thank Rand for showing them the way. The future enlightenment of humanity depends on it. "The hallmark of such mentalities is the advocacy of some grand scale public goal, without regard to context, costs, or means. Out of context, such a goal can usually be shown to be desirable; it has to be public, because the costs are not to be earned, but to be expropriated; and a dense patch of venomous fog has to shroud the issue of means - because the means are to be human lives.